For the basketball rule, see Five-second rule (basketball). 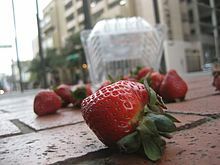 Strawberries dropped on the ground. The five-second rule suggests that if they are picked up within 5 seconds, it is safe to eat them without rewashing. The five-second rule, sometimes also the three-second rule, is a western cultural food hygiene concept that states that there is a defined window where it is permissible to pick up food (or sometimes cutlery) after it has been dropped and thus exposed to contamination. Some may believe this assertion, whereas most people employ the rule as an amusing social fiction that allows them to eat a dropped piece of food, despite the potential reservations of their peers. How many and what type of bacteria would stick to a piece of dropped food depends on many factors, the food or the floor being wet or dry among them. There is also a social dimension as eating dropped food in a restaurant or when guests are around is simply unacceptable, but in a family or private situation it may still be tolerated. There appears to be no scientific consensus on the general applicability of the rule, and its origin is unclear. The five-second rule has received some scholarly attention. It has been studied as both a public health recommendation and a sociological effect. In 2003, Jillian Clarke of the University of Illinois at Urbana–Champaign found in a survey that 56% of men and 70% of women surveyed, were familiar with the five-second rule. She also determined that a variety of foods were significantly contaminated by even brief exposure to a tile inoculated with E. coli. On the other hand, Clarke found no significant evidence of contamination on public flooring. For this work, Clarke received the 2004 Ig Nobel Prize in public health. A more thorough study in 2006 using salmonella on wood, tiles, and nylon carpet, found that the bacteria were able to thrive under dry conditions even after twenty-eight days. Tested after eight hours of exposure, the bacteria was still able to contaminate bread and bologna in under five seconds. But a minute-long contact increased contamination about tenfold (especially tile and carpet surfaces). The researchers at the Rutgers University also debunked this theory by dropping watermelon cubes, Haribo strawberry gummies, plain white bread, and buttered bread from a height of five inches on to the ground. The surfaces selected were slathered in Enterobacter aerogenes. The surfaces used were carpet, ceramic tile, stainless steel and wood. The food was left on the surface in intervals of 5, 30 and 300 seconds. The scientists assessed the amount of E. aerogenes transferred between surface and food. Since bacteria tended to be attracted to moisture, wet food had more risk to have bacteria transferred than dry food. To the surprise of the researchers, carpet transferred fewer bacteria than steel or tile. Wood was hard to pin down. It showed a large variation. "The five-second rule is a significant oversimplification of what actually happens when bacteria transfer from a surface to food," Donald Schaffner, a Rutgers University biologist and an author of the research, said in a statement in the Washington Post. "Bacteria can contaminate instantaneously." The five-second rule was also featured in an episode of the Discovery Channel series MythBusters. There was no significant difference in the number of bacteria collected. The aspects that affect the contamination process is the moisture, surface geometry and the location. Ted Allen put the rule to the test in an episode of Food Detectives, and found that bacteria will cling to food immediately. Vsauce, a YouTube channel, also dedicated a video to this topic. A 2006 study could not verify the "rule" and looked at tile, wood, and carpet floors. It indicated that bacteria can survive on grounds for long time. A 2016 New York Times article states "You may think your floors are so clean you can eat off them, but a new study debunking the so-called five-second rule would suggest otherwise." In response, a pediatrician discounted the danger in consuming certain foods dropped onto floors. A 2014 study, by biology students at Aston University in England, suggested that there may be a basis for the five-second rule. Anthony Hilton, head of microbiology at Aston University, indicated in 2017 that food dropped on a seemingly clean floor for a few moments can be eaten with minimal risk. ^ Leanna Skanulis (2007). "'5-Second Rule', Sometimes". WebMD. Retrieved March 15, 2017. ^ Julie Deardorff "Capsule: The five-second rule" Los Angeles Times, August 9, 2010, accessed January 18, 2011. ^ a b Picklesimer, Phyllis (2003-09-02). "If You Drop It, Should You Eat It? Scientists Weigh In on the 5-Second Rule". ACES News. University of Illinois College of Agricultural, Consumer, and Environmental Sciences. Retrieved 2013-05-04. ^ Dawson, P.; I. Han; M. Cox; C. Black; L. Simmons (April 2006). "Residence time and food contact time effects on transfer of Salmonella Typhimurium from tile, wood and carpet: testing the five-second rule". Journal of Applied Microbiology. 102 (4): 945–953. doi:10.1111/j.1365-2672.2006.03171.x. PMID 17381737. ^ McGee, Harold (2007-05-09). "The Five-second Rule Explored, or: How Dirty Is That Bologna?". The New York Times. Retrieved 2007-05-09. ^ "The 'five-second rule' for eating food? Scientists just demonstrated how gross it is". Washington Post. Retrieved 2017-02-10. ^ "Annotated Mythbusters: Episode 39 Chinese Invasion Alarm, 5 Second Rule". Retrieved 2008-08-17. ^ "Food Detectives, Episode OF0101". Archived from the original on 2011-05-06. Retrieved 2011-01-31. ^ Vsauce (30 November 2012). "Is The 5-Second Rule True?" – via YouTube. ^ Anupriya, P.; Han, I.; Cox, M.; Black, C.; Simmons, L. (2007). "Residence time and food contact time effects on transfer of Salmonella Typhimurium from tile, wood and carpet: testing the five-second rule". Journal of Applied Microbiology. 102 (4): 945–953. doi:10.1111/j.1365-2672.2006.03171.x. ISSN 1364-5072. PMID 17381737. ^ Mele, Christopher (2016-09-19). "'Five-Second Rule' for Food on Floor Is Untrue, Study Finds". The New York Times. ISSN 0362-4331. Retrieved 2017-02-10. ^ Aaron Carroll, "I'm a doctor. If I drop food on the kitchen floor, I still eat it." New York Times, 10 Oct 2016. ^ Ryan Hooper (March 15, 2017). "'Five-second rule' for food dropped on the floor approved by germ scientists". The Independent (UK). Retrieved March 15, 2017.